Posted By:Unknown | At:8:56 PM Be the first to comment! 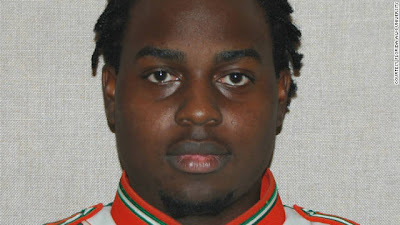 (CNN) -- Band members who were with Florida A&M University drum major Robert Champion on the bus in a parking lot in Orlando, Florida, where he died last month tried frantically to get him help when they realized he was not breathing, a 911 tape released Thursday reveals. "One of our drum majors is on the bus and not breathing," a male caller tells a female dispatcher for the Orange County Fire Rescue. "Is he breathing or is he not breathing?" she asks. "We don't know if he's breathing or not, but we need to get an ambulance ASAP." "I have help on the way already," she says. She asks, "Is he awake?" "He's not even responding. He's responding a little. He wasn't responding. We thought he was breathing. He was making noises, but I don't even know if he's breathing now." "His eyes are open; he's not responding." "I have no idea. I cannot tell you. He just threw up." The dispatcher then asks whether Champion was shaking prior to stopping breathing. "No, he wasn't. He wasn't shaking. I don't even know how he was. He was just sitting there. We were just talking and the next thing you know, he was shaking and not doing anything." Asked again whether Champion was shaking, the caller -- who says he has left the bus in order to hear the dispatcher -- tells her, "No, no, he wasn't shaking. He wasn't moving. I don't know what's going on." The dispatcher then calmly asks him to get back on the bus. "I want you to see if he's breathing, because that's very important," she says. After a silence, the voice of another man tells the dispatcher, "Ma'am, we have a band member right here," he says. "He's on the bus and he's not breathing." He says, "I tried to give him CPR and he started to vomit." "OK, and you're right by him now?" she asks. "He's in my hands, ma'am. He's cold. He's in my hands." Asked to lay Champion flat on his back on the floor of the bus, the man says, "OK, I'm going to try. He's heavy." "I understand," the dispatcher says. "Just try to do your best, OK?" After more silence, the conversation resumes. "All right, cool. He's flat. He's flat on this back." "OK, then I want you to kneel next to him and I want you to look in his mouth for food or vomit." "There is vomit in his mouth?" "OK, then I want you to turn his head to the side and I want you to clean out his mouth and his nose." At that, six minutes after the call started, the connection is lost. The dispatcher calls back and gets a recording: "Sorry, you've reached me at a time of inconvenience." Band director Julian E. White told CNN Atlanta affiliate WXIA that he was walking to dinner when he saw the police and paramedics show up pull into the parking lot. "I followed them, and that's when I saw that Robert was laying on the bus and, obviously, having medical difficulty," he said. He said the drum major looked like he had passed out. "At that point, my concern was getting the best medical attention that I could for Robert." He accompanied Champion to Dr. P. Phillips Hospital, where he was pronounced dead. His death at age 26 occurred on November 19 after a football game that included a halftime performance by the Florida A&M Marching 100 band. Officials have said his death was related to hazing. The tape was made public Thursday as a school official confirmed that FAMU had dismissed four students. The dismissals were announced Tuesday in a letter from university President James Ammons to the board of trustees. Another 30 students were dismissed from the band, Ammons wrote. Florida Gov. Rick Scott called Thursday for a review of state universities' hazing and harassment policies. "Hazing should be strictly condemned on our college and university campuses and by any organization associated directly or indirectly with our institutions," Scott said in a letter to the chancellor of the state university system. He asked Chancellor Frank Brogan to request that the state's 11 university presidents to "remind students, faculty and staff of these policies and procedures and how potentially detrimental hazing can be." Champion's family has said it plans to sue the school "to get answers." Speakers at Champion's funeral in Decatur, Georgia, described him Wednesday as a kind person and a leader dedicated to achieving his goals. "Robert gave us his all every time that he took the field. ... Whenever Robert heard the sound of the drum, his knees raised, his toes pointed and he was on a mission to make the FAMU community proud," said White, who began leading the 420-member FAMU band in 1998. Ammons moved to fire White shortly after Champion's death, citing "alleged misconduct and/or incompetence involving confirmed reports and allegations of hazing with the Department of Music and the 'Marching 100.'" White, who has hired an attorney to fight for his job, said he has zero tolerance for hazing, which he described as a national problem. "This is a problem that we are going to have to address as a nation if we are going to save the youth of America," he said. Under Florida law, any death that occurs as the result of hazing is a third-degree felony. After the death, Ammons suspended all band performances and said he would convene a task force "to determine if there are any unauthorized and questionable activities associated with the culture of the Marching 100."